Not exactly a Chinese festival — but still the people in Hong Kong do celebrate Christmas. So what do Hong Kong people do on Christmas? Go to TST East to see the lights on the buildings — it is really very pretty. 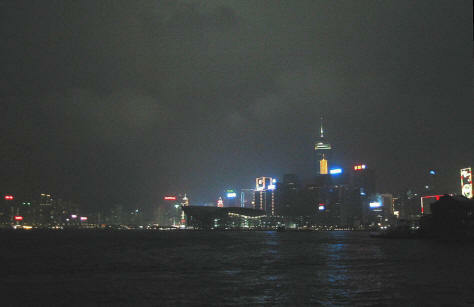 You see those buildings up close, then look out across the harbour to the Christmas Lights on the Hong Kong island. Visit the “Hong Kong WinterFest” — It started around year 2000 and have been really successful. WinterFest is more of a distributed thing with multiple Christmas themed events all over town rather than one fair is it was in prior years. The day after is a holiday too — “Boxing Day” based on the English tradition. Of course most people take days away between this and the New Year to make a long holiday break. The Christian churches run religious services as you would expect and St John’s Cathedral and so on are busy — we used to go to the Union Church one most years in the old days as my family were friends with some people there though we are not religious ourselves. Also look out for Christmas fairs held in hotels or open air which typically run by local westerners and therefore the goods and gifts they sell are more westernized too. Local international schools may also run school fairs with food stalls, second hand items to sell and game stalls for kids. Some charge an admission fee and some don’t. 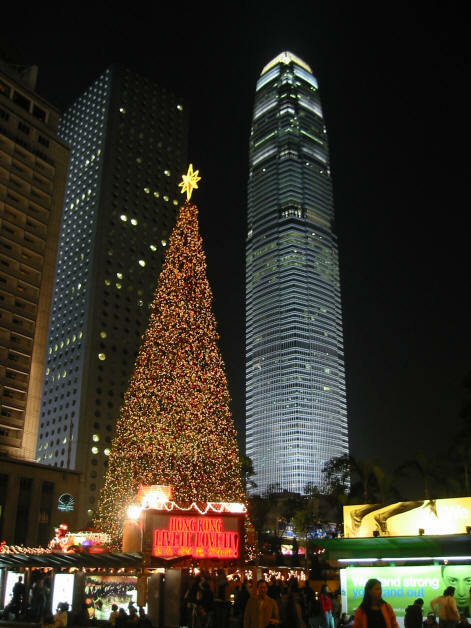 This view taken in Statue Square shows the Mandarin Oriental Hotel on the left, then Jardine House (HK’s tallest building 40 years ago), the giant Christmas tree, and finally IFC Two (no. 2 tall building in hk) on the right. This view of the harbour from a ferry shows the Hong Kong exhibition and convention centre in the middle — the low dark structure, and behind it the brightly lit buildings of Hong Kong. The tallest tower in this view is Central Building, which is nowhere near Central! It’s in Wanchai, but never mind. The view is really wonderful and pretty but hard to capture in a photograph, at least with my limited photographic skills.